This weekend I drove 125 miles to Los Angeles to take part in a special event with Operation Gratitude, a charity Upper Deck has been partnering with for a number of years now. 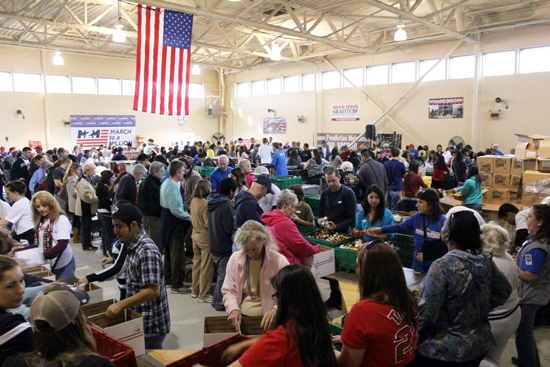 Operation Gratitude’s main purpose is to mobilize volunteers to put together care packages for members of the United States military serving abroad. One of the organization’s new programs will be putting together care packages to veterans who could definitely use an appreciative package thanking them for their service. Upper Deck loves the idea of thanking members of the military with care packages and has donated tens of thousands of packs of trading cards to Operation Gratitude over the years, most recently on Veteran’s Day. To be able to provide servicemen and women with a little piece of home through Upper Deck trading cards is an exciting opportunity for the company and a great way to say thanks for their service. Volunteers work like busy bees to assemble care packages for members of the military and veterans! Photo provided courtesy of Operation Gratitude. 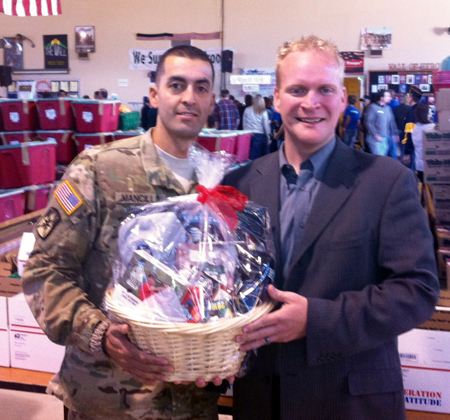 Operation Gratitude was celebrating a pair of exciting initiatives that day as they packaged their 900,000th care package and delivered some items from the 800,000th care package to Specialist Mancilla of the United States Army. Upper Deck was excited about playing a role in Specialist Mancilla’s care package as he received a very nice gift basket of new Upper Deck products and was presented with an autographed LeBron James promotional poster. 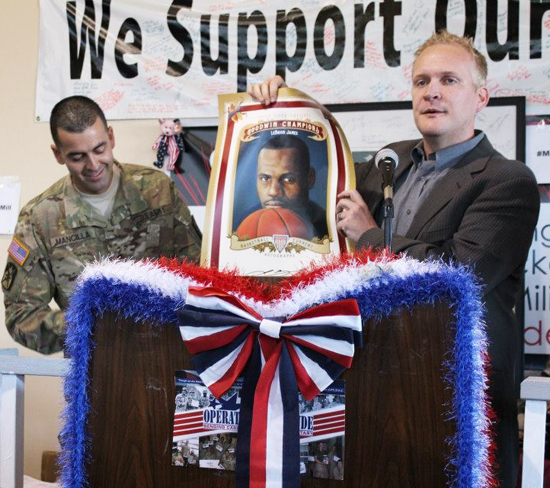 Specialist Mancilla from the U.S. Army was Operation Gratitude’s 800,000th care package recipient and Upper Deck sweetened the package by sharing a gift basket with him and an autograph LeBron James promotional poster. Photo provided courtesy of Operation Gratitude. And on the occasion there are a variety of celebrities in attendance excited about taking part in the event like Erik Estrada from “CHiP’s” fame and Joe Mantegna from the hit show “Criminal Minds.” It was neat to see how excited they were to play a small role in the event and they posed for pictures with many of the volunteers. 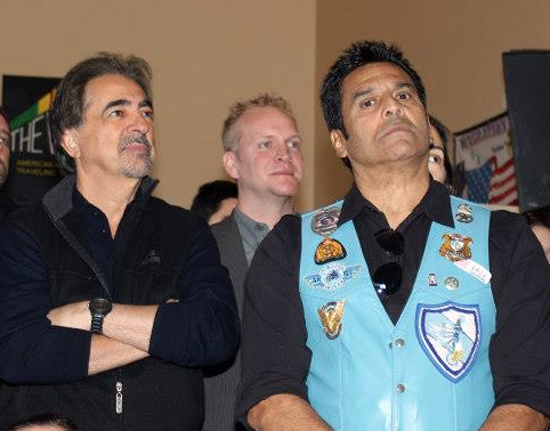 Joe Mantegna and Erik Estrada were on hand to lend some star power to the charity event. Photo provided courtesy of Operation Gratitude. It was inspirational to see the hundreds of volunteers working like a well oiled machine putting together care packages for the troops. There are a variety of stations at the facility and one of my favorites is an area where you can write letters to the troops to include in the packages. I think it is pretty awesome to be able to write a thank you to members of the military serving our nation and hopefully they enjoy a hand-written note of appreciation from volunteers like me. 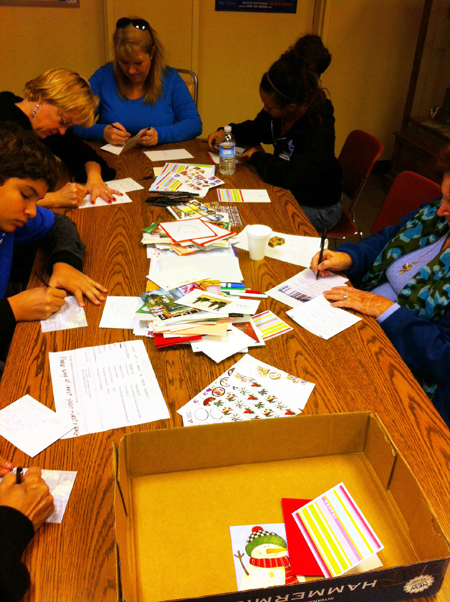 Volunteers hand-write letters thanking members of the military serving the U.S.A. abroad for their service. Upper Deck remains committed to recognizing and thanking members of the military for their service. Look for Upper Deck to continue to partner with charitable organizations like Operation Gratitude to thank members of the military. Upper Deck is already the “collector’s choice,” and with efforts like this we hope to be the “military’s choice” as well. Being able to provide members of the military with a nice distraction through trading cards is a great way to say thank you for their service. For more information on Operation Gratitude including how to donate, please visit their website, Facebook page or Twitter page! Chris call me next time you head over. I had a great time when I was there last and would have loved to help out that day also! And thanks you for doing it, we veterans appreciate the support!